Most of us have something that is, shall we say, a little off the bell curve. Some exquisite oddity that doesn’t quite jibe with the standard perceptions of conformity–whatever those perceptions happen to be today. And now, thanks to modern technology, our “interesting stuff” appears front and center on the flickering blue screens of our computer thingie-do’s. For all to see. This sort of “show and tell” engenders a myriad of reactions. Snarky stuff, for sure. But on the flip side, there is also a sense of “relief.” Yes, relief… Because in a world of a few billion people, a hearty chunk of them got what we got. That’s good news in my book. I found this out by writing songs—funny songs about my personal problems and I have slowly changed my attitude from “hiding out” and “covering up” to “oh what the hell, let’s celebrate.” Why? Because keeping secrets takes too much energy and I’m exhausted. So I have big feet. Which would be fine if I was six feet tall. But you’ve seen the pictures. I need to stand on a fricking box to reach my husband’s neck. “Proportion” is not the word that comes to mind. But then again, I do have feet. And they work. So let’s make funny. But the best part happens later when one woman after another presses her foot against mine and we both giggle at the glorious “bigness” of our shoes. It’s a celebration. 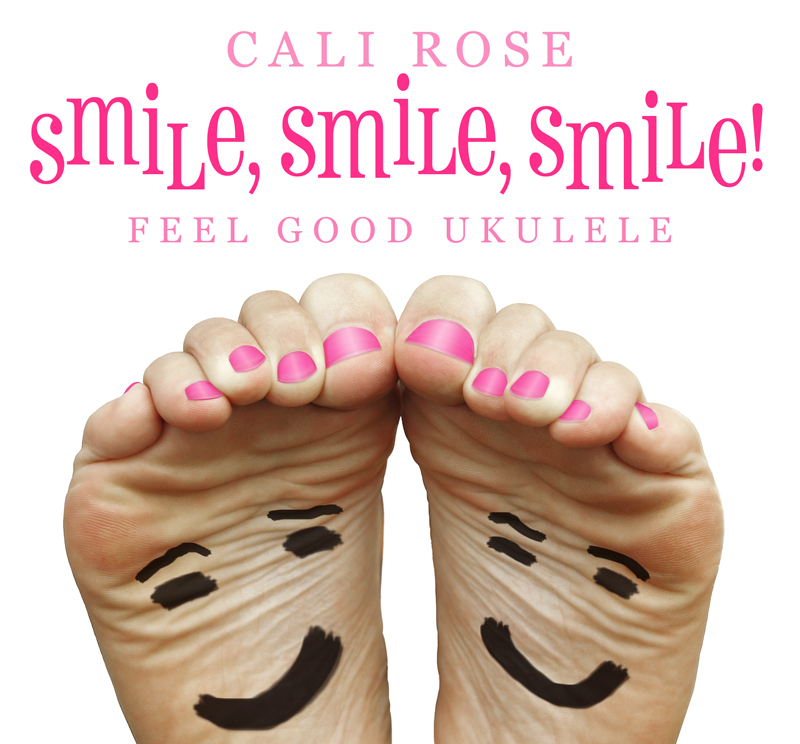 My husband and I performed “Big Feet” at the Lake Anne Ukulele Festival this summer in Reston, Virginia. It was rainforest hot and humid that day. Good feet-growing weather. CLICK HERE to watch. You can also purchase the CD online at iTunes, CD Baby, Amazon, Flea Market Music and on my website. Enjoy forty minutes of “cheer-me-up” in your day. The album is a great gift for your neighborhood foot doctor too! 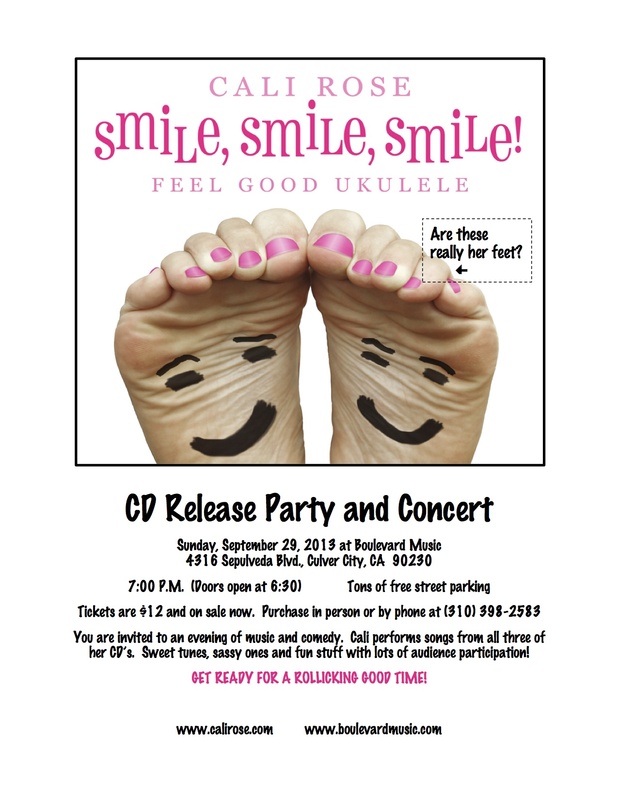 And speaking of celebrations… You are invited to my CD Release Party and Concert Sunday September 29, 2013 at Boulevard Music in Culver City. So “get dem” feet to the door!